So, welcome to the blog! Anyone who used to read my exploits on the SAW blog will be familiar that every once and a while I used to create a post that reviews a new art book. Therefore, it is with great pleasure that I bring you those same proceedings here on 'spanner in the workZ'! This first review is very special as it features a self-published book by an artist Chris Chapman. I'll make no apologies for my obvious bias for the simple fact that Chris is a good friend of mine and peer whom I studied Fine Art with at Somerset College. Nonetheless I wish to (as objectively as I can) pay dues, review and acknowledge in the public realm her work presented in this unique and professional book. Titled, ‘100 Cans’ this book, pardon the pun, is literally what it says on the tin! 100 photos of cans found on roadsides, picked up by the artist and photographed. Sounds simple, and in a way it is, but therein lies its beauty. Who when out on a walk or in a car ever stops to look at a squashed beer can discarded in a hedge? Its rubbish, why would we ever pause to look at it, yet alone admire it? And you can forget about thinking about picking up someone else’s can, you don’t know WHERE it’s been! Chris Chapman DOES go picking up those cans, in fact she actively goes out specifically in search of them. Whilst most artists (and I hold my hand up to being in this category) are in the studio making mess from bought materials she is outside making it from the stuff that others have thrown away. It’s an exciting philosophy and one that has resonances of alchemy and the idea of ‘turning something out of nothing’. The intention certainly isn’t to make those who prefer the studio, like myself, feel guilty. I do, like many others, my fare share of recycling and don’t go around throwing my rubbish anywhere other than a bin, but it does highlight the issues of waste and how through an art practice of looking at something seen as ‘waste’ as ‘art’ can possibly be beneficial in pricking the conscious of our consumerist society and how we think about litter. In Chapman’s words the project is fully titled, “100 cans after Andy Warhol. This book is one of a series highlighting the issues of waste, litter and flytipping in the local environment.” Art history fans amongst you will need no explanation to the reference this work has with Warhol’s silkscreen prints of Campbell soup cans in the 60’s-70’s. Back then consumerism, shopping and spending were the holy grail of American culture, the lifestyle, wealth, business and popularity that surrounded it. Supermarkets were galleries and galleries were like supermarkets to Warhol. Less than thirty years later and we began to see the affects of our consumerist and throw-away lifestyles. The glossy advertising, colours and logos of Warhol’s cans are replaced by the reality of their used, crushed, rusty counterparts in Chapman’s photos. 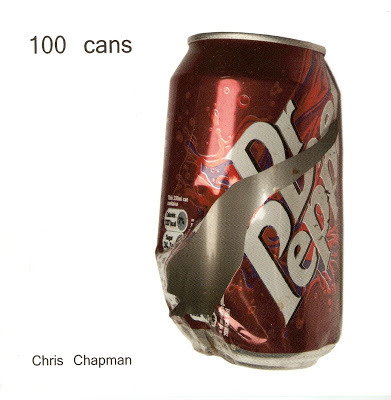 In a painful irony Chapman’s cans look more like Warhol’s ‘car crash’ screen prints than his soup cans, but if anything it shows that despite his consumerist tendencies that Warhol was also all too aware of the fragility of man-made objects. Perhaps in a way Warhol also had the right idea in highlighting the ‘beauty’ of packaging with his soup cans and brillo boxes showing a reverence for the packaging as to its contents. Maybe in ‘waste’ terms if we all had a similar respect or at least awareness for the packaging around the product instead of just its contents then maybe Chris would have to find another subject matter for her work?! What’s interesting ,if not also depressingly accurate is that Chapman doesn’t need to put a context to these images in the way of saying where exactly they were found because they could be found anywhere. They are a common if embarrassingly familiar site on any road, park or hedgerow. 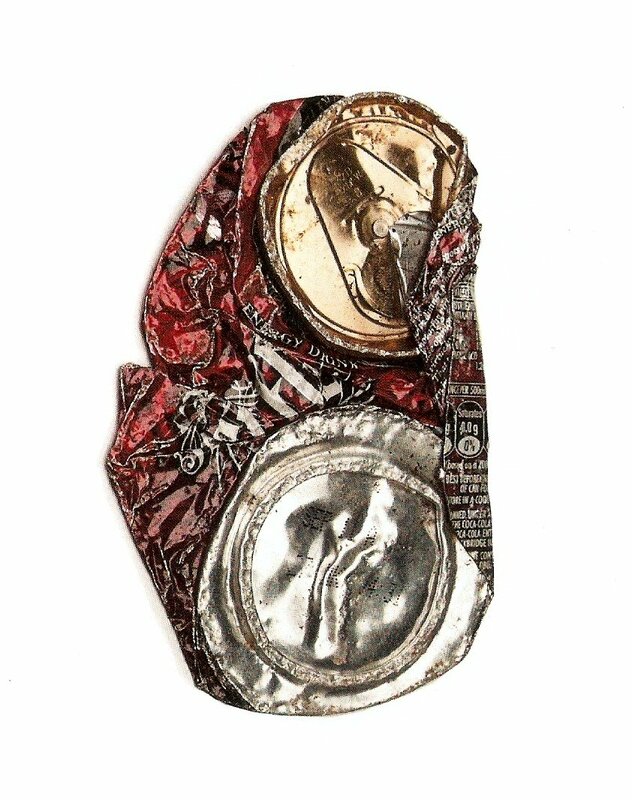 Like the American artist Mierle Laderman Ukeles who swept the streets of New York as a piece of environmental art activism, Chapman is another one of that category of artists doing a service for society whilst also collecting the discarded cans that become the subject of her work. For me, the images of cans in this book are depicted like ancient archaeological relics (each one coated in specks of dirt, encrusted with weathered signs of age, leaf litter and rust) are given the prestige of its own page, glistening against a white background. Some are almost unrecognisable as a can and become jewelled fragments each and everyone unique and of different shape. No two squashed cans are the same shape, the same contortion or the same rusting. It is easy to see how one can become obsessed with the formal qualities of these objects as each is so unique. Walking to the shop for the paper this morning I saw several cans along the roadside and instead of not ever really noticing them at all, I began to first attempt to identify them like an urban can-spotter. I then actually picked several up and put them into a bag, ‘every little helps’. I can’t say that I’ll have the time or conscience to do this every time I leave the house, but at the very least I am more aware of cans and indeed litter than I used to be and if I can’t beat them by picking them all up then at least I can learn to appreciate them. Woah! That is definitely upsetting, but also very interesting and would make anyone think twice about throwing anything away if they knew what it could do. Shocking.